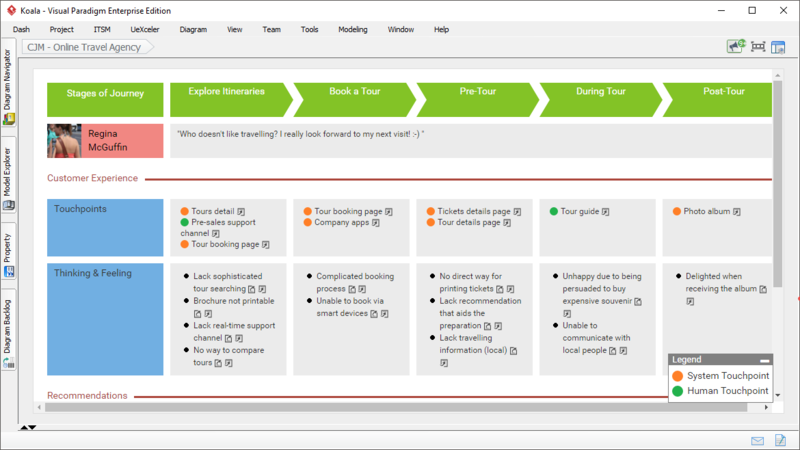 Customer journey map illustrates the relationship of a customer with a business over a period of time using storytelling technique and visual cues. Story are being told from the perspective of customer, which provides insights of the total experience from the customers, helping your get a better understanding and addresses customers' needs and pain points as they experience your product or service. 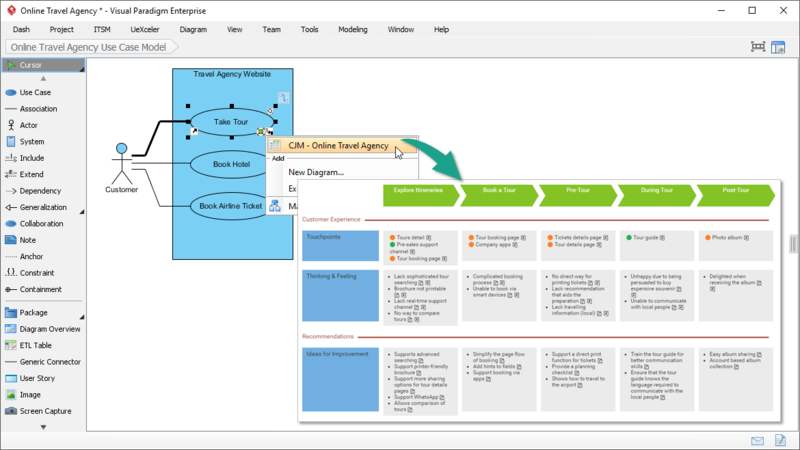 Customer Journey Mapping is a compact visualization of an end-to-end customer experience. It helps businesses deepen their understanding of their customers' behaviors, thoughts, and feelings, empowering businesses to make value-driven decisions based on a customer experience model. 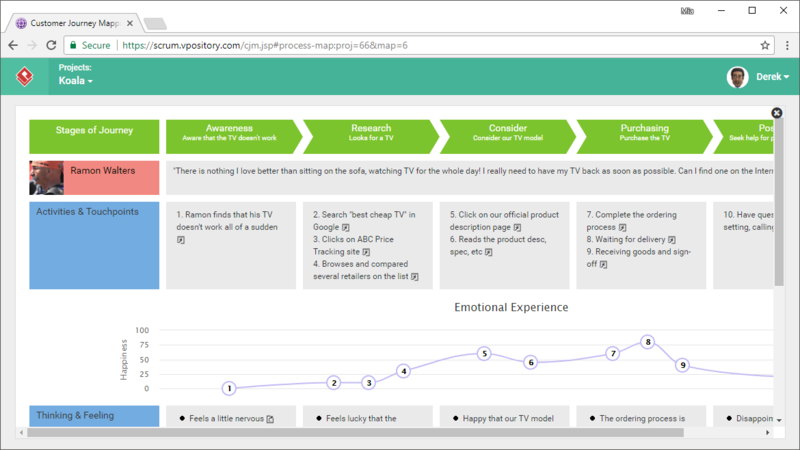 Develop Customer Journey Map online to visualize an end-to-end customer experience. Understand customer's pain points and react accordingly. 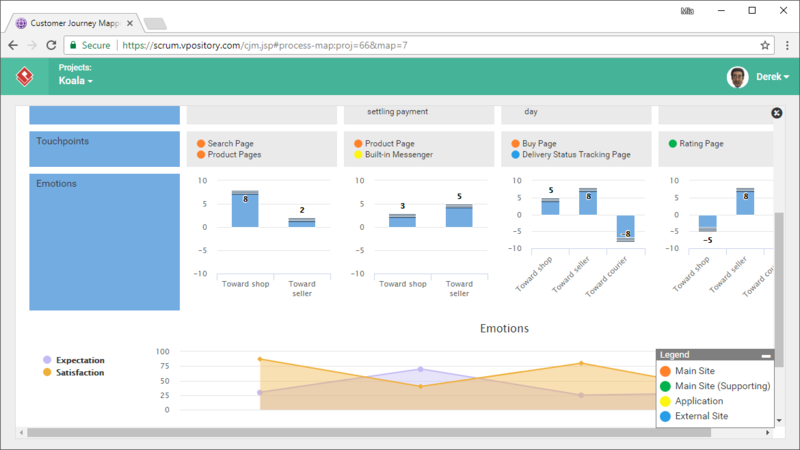 Add charts into your journey map to represent statistical data or trend. For instance, customer emotional changes. Use images to illustrate a customer journey. Besides, apply emotional chart to represent customer feeling with smiley faces. Compartments in a journey map are inter-related. 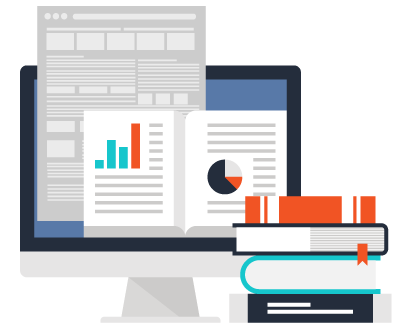 Visual Paradigm enables you to establish and keep track of the references in between. The relationship is also visible on the journey map. 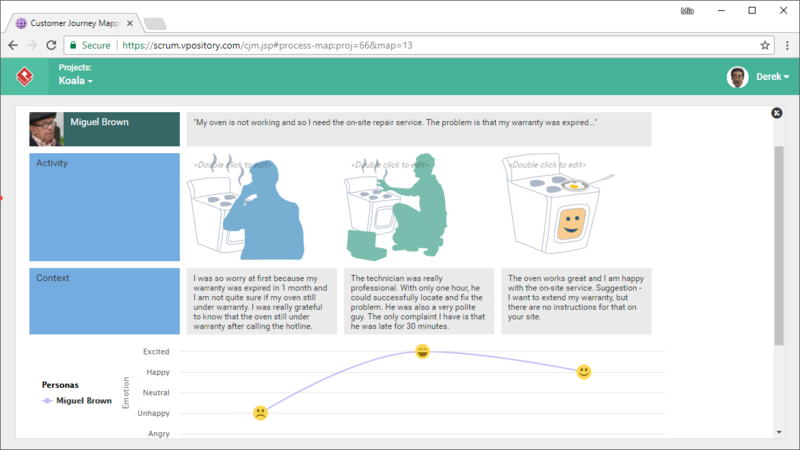 Click to generate a report that contains all the data in a journey map. 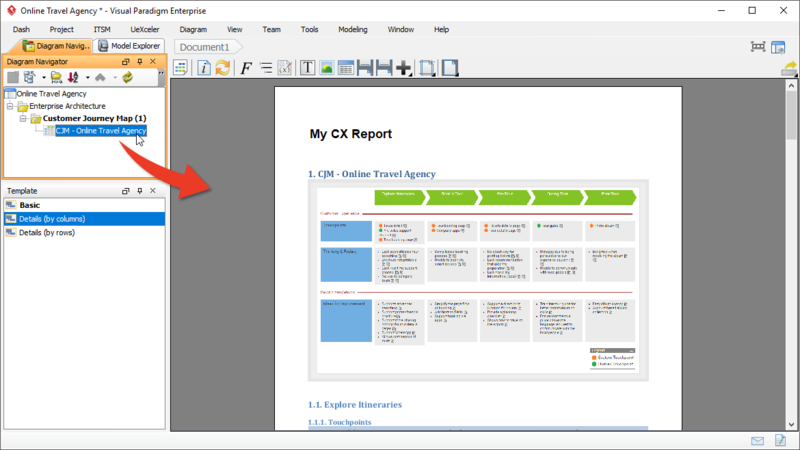 Besides report generation, you can develop your own report by integrating the Customer Journey Map as part of the report's content. 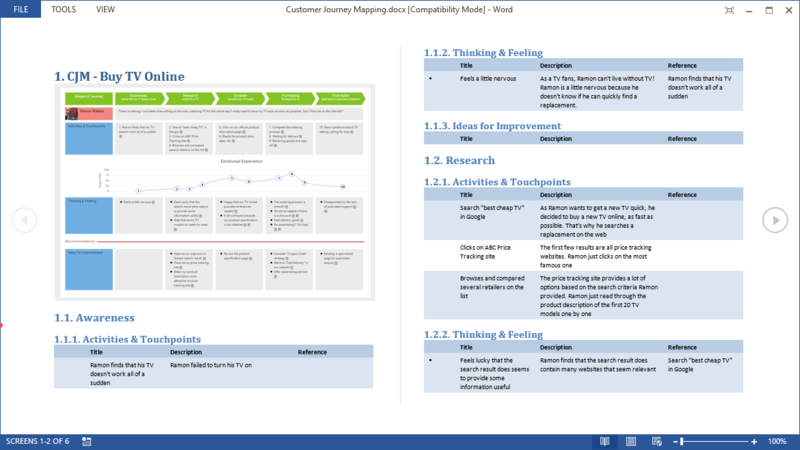 Develop context-based Customer Journey Map by integrating it with other parts of your model. 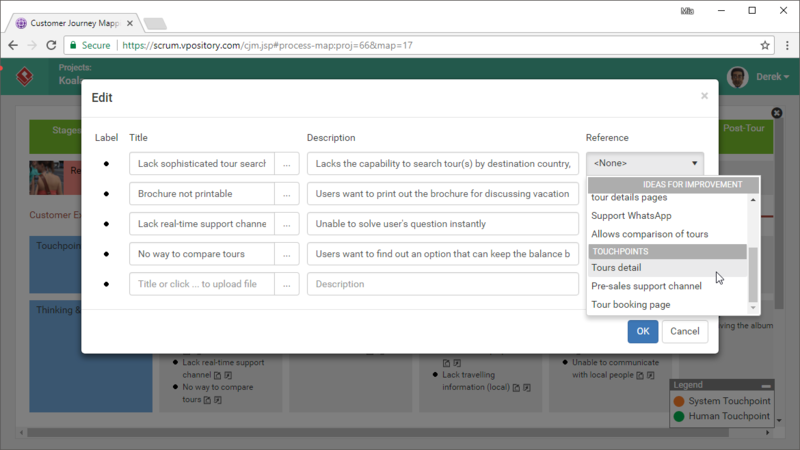 For instance, you can assess the customer experience of a use case by developing a journey map under the use case. You want to create memorable first impressions and deliver various buying experience for your customers? You want to find out how your customers are making their purchases in today's digital world? You want to find out the most influential channels and touch points throughout a customer journey and how you could impact these factors? You want to know how the market will react to your new product? Provide a bird's eye view of the entire customer journey. Bring teams together to resolve specific customers' hurdles while understanding the core customer journey paths. Increase customer conversion rates by minimizing negative customer experiences, through identification of key steps and decision points. Improve customer retention, by understanding how they transit through. For example, ensure all the information is available and accessible to all the stakeholders during each stage of a procurement cycle. Businesses can zoom-in on a single customer journey in a specific channel. Understanding the required metrics to identify customer's progress and fall out points, providing opportunities to bring customers back on board. You can always find out more on this feature by following our tutorials.